Live out the excitement of being on one of the most popular game shows in the world with Jeopardy slots by Wagerworks. This exciting slots game offers players the feels of Jeopardy while offering a twenty five thousand coin jackpot. With coin values ranging from one cent to one dollar, there are many possible payouts to be won. Jeopardy slots offers players a familiar backdrop, as the screen looks much like the Jeopardy playing board. Symbols used on the reels include the Double Jeopardy multiplier wild symbol, the Jeopardy bonus symbol, the Jeopardy logo, the red seven, the gold seven, the blue seven, single, double, and triple bars, sports, science, music, movies, and animals. With a maximum payout of twenty-five thousand coins, players betting the maximum can find themselves with remarkably large winnings in this game. There are nine total paylines offered in Jeopardy slots, with three running horizontally through the five reels and the remainder running in a combination of diagonal and horizontal lines. The game does not offer an autoplay feature, but there are many exciting payouts and bonus features on offer to keep player’s attention. There is a wide array of payouts offered in Jeopardy slots. Five of the wild Double Jeopardy symbols offer players the jackpot of twenty five thousand coins. This symbol also multiplies any line win by two for each of the Double Jeopardy logos in a winning combination. Five Jeopardy symbols pay the spinner twenty five hundred coins, while four pay five hundred coins, three pay ninety, and two pay five coins. Five red sevens pay one thousand coins, four pay four hundred coins, and three pay seventy-five. Seven hundred fifty coins await players who get five gold seven symbols, while three hundred twenty five are awarded for four and sixty-five are awarded for three. When five blue sevens appear on a payline, six hundred coins are awarded. Two hundred fifty coins are paid for four symbols, and forty-five are paid for three symbols. Five sevens of any type pays ninety coins, four pay thirty coins, and three pay ten coins. When a player gets three triple bars on the reels, four hundred fifty coins are awarded, while four pay one hundred fifty and three pay thirty. Five double bars pay three hundred coins while four pay one hundred and three pay twenty. Five single bars offer one hundred fifty coins, four offer fifty coins, and three offer ten coins. Five bars of any type pay forty-five coins, four pay fifteen, and three pay five. Five sports symbols pay two hundred coins, four pay seventy-five, and three pay fifteen. Five science symbols offer a one hundred seventy five coin payout, while four pay sixty and three pay twelve coins. One hundred fifty coins are paid for five music symbols, while four pay forty-five and three pay nine. Five movies symbols pay one hundred twenty five coins, four pay thirty-five, and three pay seven. Five animal symbols pay the winner seventy-five coins, four pay twenty-five, and three pay five. 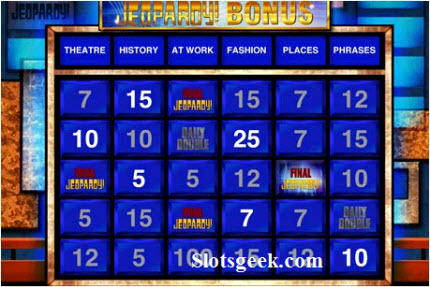 Three Jeopardy bonus symbols trigger a game in which the player selects different Jeopardy clue symbols to reveal prize amounts until reaching final Jeopardy, where they will either be able to collect their winnings or risk it all and choose which player will pick the correct answer. With so many different payouts offered, there is much to enjoy about this fantastic slots game.